Producing quality American Saddlebreds and ...teaching the fine art of Equitation!!! 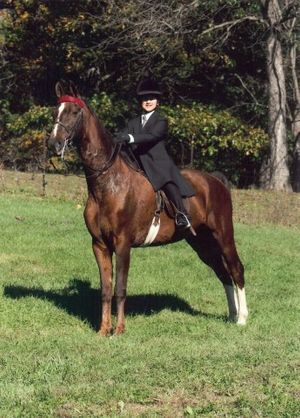 We raise quality American Saddlebred Horses, which is one our favorite breeds of horses. A breed known for its versatility in and out of the show ring. We appreciate this chance to share these wonderful horses with you. We currently stand High Point's Ivory Coast, cremello American Saddlebred stallion. Check him out on his own page: High Point's Ivory Coast or his website: hpivorycoast.webs.com. To see extra pictures, check out the photo gallery. Mark your calendars -- summer horse camps days will be returning in 2014 - Dates June 30 and July 1 or July 5-6. Besides riding lessons we offer a Summer Horse Camp. It is open to beginners through advance riders and ages 7 to 16 years. It is an opportunity to learn to ride or improve your riding skills. The campers have lots of FUN horse filled days! News page contains information on news from the barn, current happening, events, and new arrivals. To see photos of all the fun happening at Irish Hills Farm see the photo gallery.